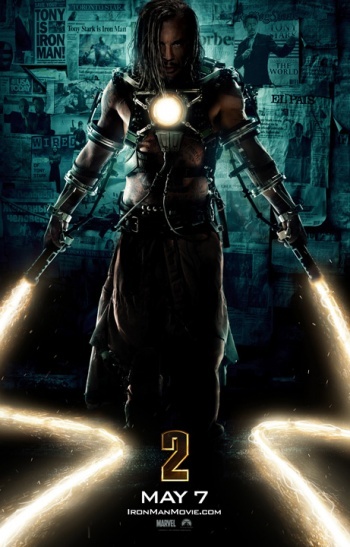 Is Iron Man Ripping Off the Prince of Persia? The recently-revealed teaser image for the upcoming Iron Man 2 feature film looks more than a little familiar. There are many things to be surprised about in the newly-unveiled movie poster for next May's Iron Man 2, starring Robert Downey, Jr.: Who is this scraggly, long-haired man, and what is his connection to businessman superhero Tony Stark? (Answer: It's Mickey Rourke as Whiplash, the film's antagonist, but pretend you don't know that - I certainly didn't). 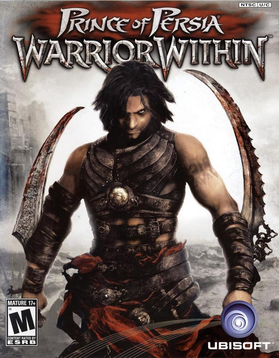 But if you're a gamer, there's another question that comes to mind: Why the hell does this poster look virtually identical to the cover art for 2004's Prince of Persia: Warrior Within? The pose is almost identical, and while Whiplash's energy whips are a bit more high-tech than the eponymous Prince's choice of weaponry, he's holding them in the exact same way. The two even have similar tattoos and long, scruffy hair that covers the right side of their face. It's hard to imagine that this is coincidental, seeing how the two images look so very alike. Does this mean that Iron Man 2 will have improved combat, but a overall darker and grittier atmosphere and out-of-place heavy metal soundtrack featuring Godsmack that ultimately isn't very well-received by the fanbase resulting in a third installment that gets back to the more fantastic, lighthearted tone of the first game? Er, movie? Going out on a conspiracy-theorist limb here: The release date on the poster is May 7th, just nineteen days before Paramount rival Walt Disney Pictures releases the Jerry Bruckheimer-produced film adaptation of... wait for it, wait for it... Prince of Persia: The Sands of Time, starring Jake Gyllenheimerschmidt. Iron Man was a huge hit in its own right, and so the sequel doesn't really need to piggyback on any other films, but it's hard to imagine Paramount executives not considering an Arabian-Nights Pirates of the Caribbean a threat in the least. Maybe I'm overthinking it. Anyway, if movies were going to start taking their cues from video games instead of the other way around, the fantastic Sands of Time trilogy is hardly a bad place to start. What do you guys think: Intentional, or is this just a coincidence?